Research led by a University of Oregon doctoral student in California’s Santa Cruz Mountains has uncovered geologic evidence that supports historical narratives for two earthquakes in the 68 years prior to San Francisco’s devastating 1906 disaster. 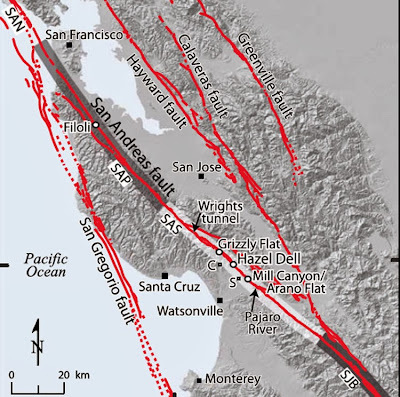 The evidence places the two earthquakes, in 1838 and 1890, on the San Andreas Fault, as theorized by many researchers based on written accounts about damage to Spanish-built missions in the Monterey and San Francisco bay areas. These two quakes, as in 1906, were surface-rupturing events, the researchers concluded. Continuing work, says San Francisco Bay-area native Ashley R. Streig, will dig deeper into the region’s geological record — layers of sediment along the fault — to determine if the ensuing seismically quiet years make up a normal pattern — or not — of quake frequency along the fault. Streig is lead author of the study, published in this month’s issue of the Bulletin of the Seismological Society of America. She collaborated on the project with her doctoral adviser Ray Weldon, professor of the UO’s Department of Geological Sciences, and Timothy E. Dawson of the Menlo Park office of the California Geological Survey. The study was the first to fully map the active fault trace in the Santa Cruz Mountains using a combination of on-the-ground observations and airborne Light Detection and Ranging (LiDAR), a remote sensing technology. The Santa Cruz Mountains run for about 39 miles from south of San Francisco to near San Juan Batista. Hazel Dell is east of Santa Cruz and north of Watsonville. “We found the first geologic evidence of surface rupture by what looks like the 1838 and 1890 earthquakes, as well as 1906,” said Streig, whose introduction to major earthquakes came at age 11 during the 1989 Loma Prieta Earthquake on a deep sub-fault of the San Andreas Fault zone. That quake, which disrupted baseball’s World Series, forced her family to camp outside their home. The team identified ax-cut wood chips, tree stumps and charcoal fragments from early logging efforts in unexpectedly deep layers of sediment, 1.5 meters (five feet) below the ground, and document evidence of three earthquakes since logging occurred at the site. The logging story emerged from 16 trenches dug in 2008, 2010 and 2011 along the fault at the Hazel Dell site in the mountain range. High-resolution radiocarbon dating of tree-rings from the wood chips and charcoal confirm these are post European deposits, and the geologic earthquake evidence coincides with written accounts describing local earthquake damage, including damage to Spanish missions in 1838, and in a USGS publication of earthquakes in 1890 catalogued by an astronomer from Lick Observatory. Additionally, in 1906 individuals living near the Hazel Dell site reported to geologists that cracks from the 1906 earthquake had occurred just where they had 16 years earlier, in 1890, which, Streig and colleagues say, was probably centered in the Hazel Dell region. Another displacement of sediment at the Hazel Dell site matched the timeline of the 1906 quake. The project also allowed the team to conclude that another historically reported quake, in 1865, was not surface rupturing, but it was probably deep and, like the 1989 event, occurred on a sub zone of the San Andreas Fault. Conventional thinking, Streig said, has suggested that the San Andreas Fault always ruptures in a long-reaching fashion similar to the 1906 earthquake. This study, however, points to more regionally confined ruptures as well. The frequency of the quakes in the Santa Cruz Mountains, she added, must have been a terrifying experience for settlers during the 68-year period. The U.S. Geological Survey funded the research through grants 08-HQ-GR-0071, 08-HQ-GR-0072, G10AP00064, G10AP0065 and G11AP20123. A Geological Society of America Student Research Grant to Streig funded the age-dating of the team’s evidence at the Lawrence Livermore National Laboratory’s Center for Accelerator Mass Spectrometry. The above story is based on materials provided by University of Oregon.